Using a guitar pick to play acoustic guitar is really just a matter of preference. However, you really need to know what style of acoustic guitar you want to ultimately play. Most contemporary acoustic guitar players choose finger-style rather than using a pick. Generally they prefer this method to be able to pluck more than one string at a time. Now, this can also be done using a combination of a pick and your fingers. So, I believe it’s important to learn both. I would recommend learning with a guitar pick at first. Let’s take a look at the two methods and I’ll explain why. If you’re going to ultimately play acoustic as a single instrument (No singing or other instrument for accompaniment) it is imperative that you learn finger style acoustic guitar. 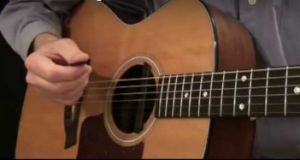 You can see some examples of finger style guitar in the video to your right. If you’re going to be playing the melody you will have to know finger style. However, if you want to sing to the guitar also? There are finger picking patterns for that too.